The Phantom Zone has begun bleeding into our world and several Argonian and Kryptonian criminals have begun an attack. Superman tells the League he is travelling into the zone and refuses their help. The League are unwilling to comply especially when Superman's signal beacon encounters interference. J'onn and Batman send in a rescue team. Superman meanwhile is trapped under Argonian Zod's rule and powerless to add insult to injury. This obviously strikes Kal as very odd as his enemies in the Zone have their powers! During his contemplation, Superman realizes his friend Ray Palmer hitched a ride via a pat on the arm from Batman! Ray tells Kal the only way they can survive and rejoin the rescue team is to use some Kryptonite he has brought with him... reluctantly Superman agrees. Superman and the Atom arrive just in time to save their friends from the Zoner's wrath. Green Lantern creates a glitterball sending Kryptonite rays throughout the Zone and activates their retrieval signal to escape. Once safely on Earth Superman reveals he knew Mr. Mxyzptlk was the only one capable of such a heinous alliance. Mxy reveals he never wanted to help Zod or the others, he just wanted to aggravate Superman. Blue Beetle is fiddling with Superman's projector and accidentally activates it sucking Mxy inside! Before Mxy can reverse his name Zod captures him and threatens a terrible revenge! After a chat with J'onn and a party thrown by Kara and the others Superman re-realizes what it means to be part of a team. Story - 5: Continuity AND progression! Hurrah for that! 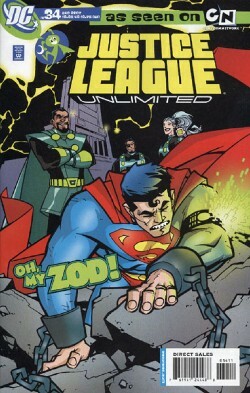 A few story booboos (Zod is Argonian in the Animated universe and immune to Kryptonite established in the recommended reading header) but this is easily overlooked as it works so well this could have been a two parter! Makes me wish the show was still going as this would have been an awesome episode arc if it was fleshed out. Art - 4: A fantastically illustrated issue, no complaints at all! Cover Art - 3: As with the cover featuring Superman and Darkseid a few months back this is a fine take on the animated style and nice to have Clark in the spotlight again. It definitely says 'cartoon' to me but just not JLU's usual high standard and style. And the "OH, MY ZOD!" tagline is a serious NO!